Have a question on Innova Crysta? Innova Crysta is available in 2 different colors - White Pearl Crystal Shine and Wildfire. Watch latest video reviews of Toyota Innova Crysta to know about its interiors, exteriors, performance, mileage and more. Toyota Innova is the name which almost all of us are familiar with. It is arguably the most successful people carrier of the 21st century in the Indian automotive scene. It is the only one which surpassed its competitors in terms of looks, performance and design. The journey of Toyota Innova started in India over a decade ago, it replaced the popular Qualis in the year 2005. The competition was quite less at that time and the people were reluctant to pay such a high amount on MPVs. Slowly and steadily Innova gained the ground and remained as the leading MPV for years with almost no competition. And despite the price hike during all these years, the vehicle commands an incredible loyalty. The new Crysta is the step ahead of the original Innova with all new build and equipment. The car is based on the TNGA (Toyota New Global Architecture) platform. 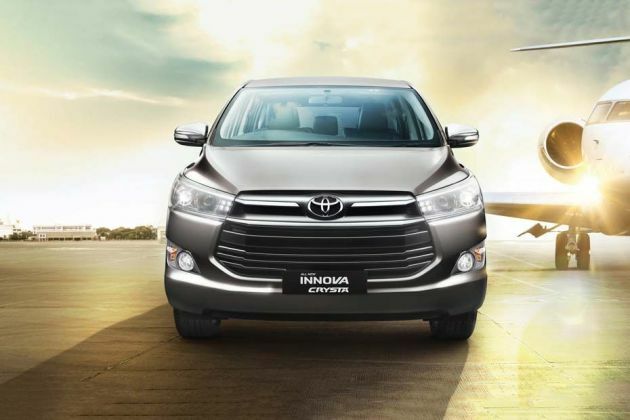 New Innova Crysta 2016 now gets cosmetic updates on the exteriors, the cabin is also been updated with the whole lot of goodies and mechanicals has been changed as well. On the outside, Toyota Innova Crysta looks aggressive, modern and muscular as compared to the outgoing model. It is also lengthier, taller and wider than the earlier version. The front gets the twin horizontal slats on the hexagonal grille that goes well with the dual barrel rectangular headlamps. The lower part of the grille gets thin black slats and edged by the fog lamps housing. The headlights get DRLS and are projector units. On the sides, Toyota Innova Crysta gets much sleeker looks, thanks to the sharply raked kink in the D-pillar and the sloping roofline. The vehicle gets the prominent shoulder line, large 17-inch wheels and flared wheel arches. The rear receives the signature bend that is seen in contemporary Toyota cars. The new Crysta is available in vibrant shades such as Garnet Red, White Pearl Crystal Shine, Avant Garde Bronze, Wildfire, Super White, Silver and Grey. As far as the interiors are concerned, the vehicle has a lot of space inside for the occupants to sit comfortably. The dashboard gets the new styling, it has the driver-centric design and is adorned in black along with the stylish metallic strip defining its outline. The 4.2 inch multi-information display looks gorgeous with blue lit. The 7-inch touchscreen unit feels like a retrofit and is slick to use. The updated steering wheel gets metal highlights and steering mounted audio controls. The car is loaded with comfort features and tech gadgetry. Among the list, the passengers get climate control, cruise control, keyless entry, rear parking camera, height adjustable driver seat, cooled glove box, and push engine start/stop button. In terms of specifications, Toyota Innova is powered by the three engine options the 2.7L petrol, 2.4L diesel and 2.8 L diesel mill. The 2.7L motor can generate the power output of 166PS and peak torque of 245Nm. The 2.4L diesel oil burner is capable of generating the power of 150PS and maximum torque of 343Nm while the 2.8L diesel engine motor can produce 174PS of power output and yields the torque of 360Nm. The 2.4L mill and 2.7L oil burner come mated to 5-speed manual transmission while the 2.8L diesel engine gets a six-speed automatic gearbox. Talking about the safety aspects, Toyota has included a variety of safety features in the list such as 7 airbags, ABS with EBD, ESP, brake assist, hill start assist and vehicle stability control. Other safety aspects included in the list are central locking, engine immobiliser, child safety lock, power door lock, rear wiper, automatic headlamps and turn indicators on ORVMs. Toyota Innova Crysta is offered in three different variants such as G, V and Z. Taking a quick glance at the pricing details. The base variant G gets the price tag of Rs. 13.52 lakh while the top trim Z is available at the price tag of Rs. 21.57 lakh. Its Touring Sport Edition is priced at Rs. 22.15 lakh while the top-selling variant 2.7 GX MT petrol is available at the price tag of Rs. 14.34 lakh. More than a decade has passed and the car is still an undisputable king in the segment. Though over the years it has become an expensive piece of machinery, there is no denying the package has been rounded well. The car looks contemporary from every angle and loaded with tech and safety features. Toyota Innova Crysta competes against the stellars in the class such as Tata Hexa and Mahindra XUV 500. The cabin set-up will really mesmerize you. It would be an understatement to say the interiors of the car has gone upmarket. The quality of materials, colour combination and multiple layers across will make you realize how plain jane the earlier Innova was. The soft top of dash feels excellent while the middle layer designed in faux wood gives a premium appeal to the vehicle. The interiors are all-black and that along with dark wood trim really suits the cabin. Toyota claims that it’s the most feature equipped MPV in the country. The highlight on the dashboard is the new 7-inch touchscreen infotainment which does a whole lot of thing right from pairing smartphones for telephony and music to navigation and relaying feeds from the rear parking camera. The 4.2 inch TFT multi-information display is another interesting addition which opens up a world of driver information. These include fuel consumption, average speed, cruising range, elapsed time, cruise control, ECO driving mode, outside temperature, phone caller display, and navigation display. The steering wheel has been wrapped in leather with a plethora of controls for music, telephony as well as cruising. Other comfort features in the car include ambient lighting system, dual zone climate control, cooled glove box, rear aircons on 2nd and 3rd row, tilt and telescopic steering, and push engine start/stop button. Sadly, the car has only a single USB port for charging and data. Coming to the seating and space, the driver’s seat is large and nicely bolstered for the long-distance travel. It can also be electrically adjusted. The rear seats are also comfortable and seem to have been shared from a premium sedan. Then there is a foldable table/bench that creates a sense of luxury and a switch to slide the front seat forward even from the middle row. The second row can be the best place to sit and relax as the rear aircons are surrounded by ambient lighting. The faux wood trims on the door panels add more to the premiumness, something which is missing at the front doors. The 3rd row can be folded individually easily for creating more luggage space. The practicality of storage and space in the car is really commendable. There are no less than 20 bottle-holders, smartphone holder for USB port and Aux-In, a couple of cup-holders and also cooled glove-box for stuffing your drinks and beverages. One of the biggest alterations in the car is the one-touch tumble 2nd row which is convenient to use. Overall, the interior of the car is several notches above the previous version and can play spoilsport for segment above luxury car buyers. The side profile is rather sharper and the strong shoulder line and creases running through the doors certainly boost up the profile. The muscular wheel arches have been filled with 17-inch alloys which are only available on the top end ZX variant. The lower variant gets 16-inch wheels. The new Crysta Innova can also be distinguished with saber-tooth inspired tail lights at the rear. The tail lamps also make the car looks wider while the aero stability wings are not only eye-catchy but also helpful in stabilizing the vehicle on high speeds by managing airflow around the vehicle. The new Innova Crysta with its stylish design really makes a strong road presence. It is now more than a functional people’s carrier given the amount of luxury and comfort it offers. The engines of Toyota Innova Crysta have been tuned for relaxed driving with low fuel consumption. With more grunt, these engines are frugal at the same time. The diesel-powered Crysta with manual transmission returns ARAI certified mileage of 13.68kmpl, the automatic version returns 11.36kmpl. On the contrary, the petrol manual variant reads 11.25kmpl, the automatic version is able to return 10.75kmpl. Like the earlier Innova, the new one is deployed on a ladder on frame chassis and uses a reinforced high-tensile steel to keep a tab on the weight. This combination along with large rear shock absorbers make the car glide through even large potholes. The ride quality is truly impressive especially looking at the typical everyday Indian road conditions. The suspension never hits the ground and makes mincemeat of speed bumps and potholes without breaking a sweat. The steering feels heavy at city speeds while a slightly more power assistant could have made easier for the car to overcome tight spots. The Japanese carmaker has introduced new engines in the Innova Crysta. The diesel-powered Crysta houses a 2.4L unit that pumps out 149PS and 343Nm of torque. The engine makes a staggering 49PS more than the earlier version and comes mated to 5-speed manual transmission. But the inclusion 6th gear would have put the engine on less stress during long journeys. Though the engine is a bit smaller than the earlier 2.5L unit, it is a 4-cylinder turbocharged unit with more grunt. While cranking the vehicle, the gear lever shakes but once the MPV in motion, it settles down and offer nice mid-top end power. The car also comes with a powerful 2.8L diesel engine that produces 174PS and 360Nm of torque. It is mated to 6-speed automatic sequential shift gearbox which does justice to the overall driving experience. There is hardly a feel of turbo-lag and the gearshifts are quick, making the car as a perfect city commuter. The new Innova Crysta also gets a 2.7L petrol motor that musters 164PS and 245Nm of peak torque. This is the same engine which is working under the hood of Toyota’s range of trucks and this clearly means that the vehicle has the capability to haul a lot of loads. It feels smooth and responsive and pulls the car nicely. The engine is mated to either 5-speed manual or 6-speed automatic depending on the variant you choose. Though automatic gearbox is smooth, it can be a problem in terms of fuel consumption as a large capacity engine is paired to old school gearbox. Both the engines come with economy and power driving modes, a great way of customizing the engine behaviour for different road conditions. The Normal mode offers a nice balance between power and fuel economy. In Eco mode, the engines are slow and relaxing and one would feel comfortable driving in urban areas. In Power mode, the engine is responsive and the throttle response is also sharper while the acceleration times get a bump. Innova Crysta gets disc brakes at front and drum at the rear. Looking at the amount of time this MPV would spend on highways, an all-disc brake would have been better. However, the brakes are still competent enough to stop the car without any drama. Even in automatic variants, the brakes don’t feel nervous. In terms of safety, the car offers dual front airbags and driver knee airbags, ABS with EBD and Brake Assist as standard fitment. Move on to the top variants and you can have a fully loaded Innova with features like 7-airbags, traction control, hill start assist, vehicle stability control, electronic stability program and Isofix & 3-point seatbelts. Awww.. 2016 Feb is too far to wait for NEW Innova!! What is the price of Toyota Innova Crysta? On road prices of Toyota Innova Crysta in New Delhi starts from ₹ 15.57 Lakh for base variant 2.4 G Plus MT, while the top spec variant Touring Sport 2.7 AT costs at ₹ 20.74 Lakh. What are the colors options available in Toyota Innova Crysta?